Owner Tom & Linsey Hoffman have combined over 10 years of professional carpet cleaning and floor cleaning experience out in the field. This unmatched hands-on experience is supported by our commitment to certification with the Institute of Inspection Cleaning and Restoration Certification (IICRC) – the industry standard in carpet cleaning and water damage restoration training. 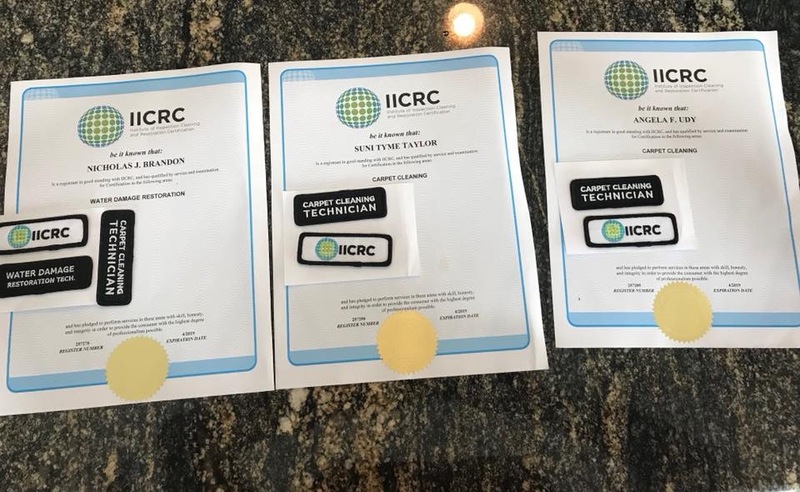 All of our technicians are IICRC certified, and we are an IICRC Certified Firm! In addition to being one of the only certified firms in our area, EVERY single technician working with our company is a Certified Carpet Cleaning Technician and upholds the highest of industry standards on every job. We also have certified Water Restoration Technicians on call 24/7/365. Rated 5 out of 5 Stars on Google! Rated 5 out of 5 Stars on Facebook!